Last modified on August 1st, 2014 by Joe. This Android tutorial will help to learn how to show splash screen in an Android application. 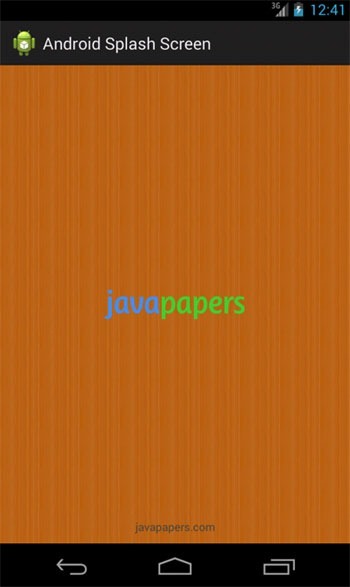 Splash screen is generally used when there is a need to do some background process when an application is initiated. Background process like loading the database, images, making a call over network. These kind of activities will consume time and a splash screen can be shown during that time. A splash screen can be the app icon, company logo and nice welcome image etcetera. Sometimes, splash screens are shown even when there is no need for a background process. This is just to showcase the brand through logo or some image and in this kind of promotional situations it is done based on fixed time interval. In this tutorial, let us see how a splash screen can be shown in an Android application. Let us see a generic code which can be used for both the cases, to show a splash screen during a background process or to show a splash screen for a fixed time interval. Lets have two Android Activity SplashScreenActivity and AppMainActivity. One for a splash screen and another for application main activity. Splash screen activity will be the Android app’s launcher activity. Splash screen will have an image background repeat tiled and a logo image shown in ImageView. Lets have an AsyncTask which will run as a async process. Any network calls, database loading can be done inside this. For this example sake, I have give a fixed time interval sleep. Once the fixed time interval is done or the background process is complete, this SplashScreenAcvitity will be closed and the AppMainActivity will be shown. This Android Manifest file is just to show that the launcher activity is the splash screen. Comments on "Android Splash Screen"
Must raise case on parameters ‘void’ to ‘Void’ on private inner class declaration. Other than that … nice tutorial! in my MainActivity there is a webview.It takes too much time to load the page. so i want to start loading the webpage in my MainActivity in background during splashscreen running. so where should i code? I am new to android. 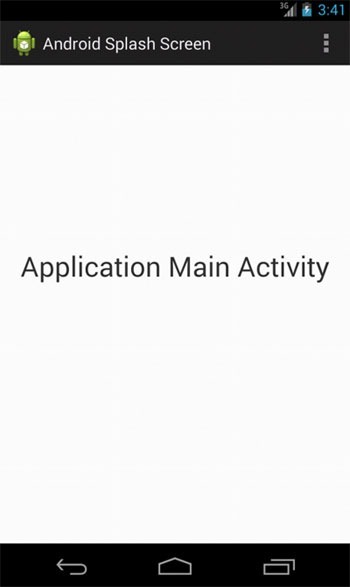 I seen that many application put application overview as slides how can i achieve that. please can you help me. Nice post.. This information may improve the user experience. Comments are closed for "Android Splash Screen". I am Joe, an Android developer fond of developing modern APPs. I'm currently available for freelance work, contact me. Looking for an expert freelance Android APP developer? Do you want to develop an engaging APP and launch quickly?